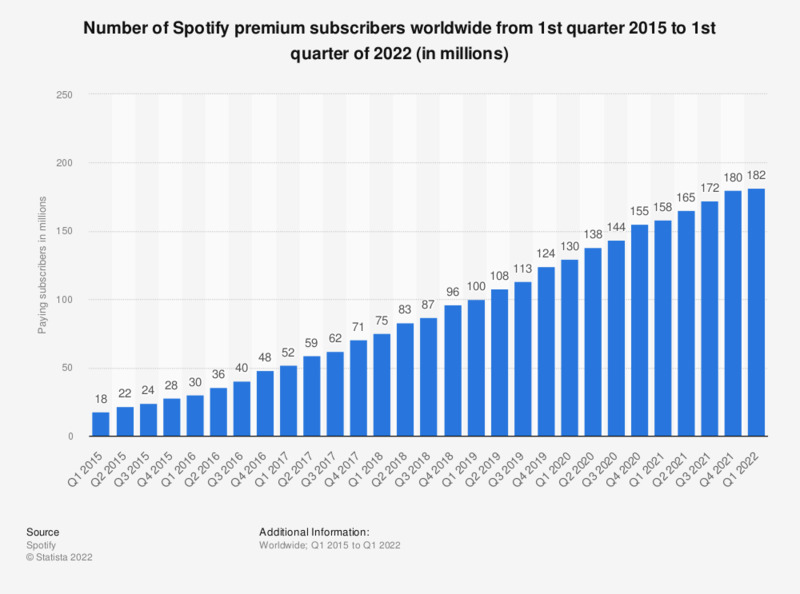 This statistic gives information on the number of paying subscribers to Spotify's music streaming service from the first quarter of 2015 to the fourth quarter of 2018. As of the final quarter of 2018, Spotify had 96 million premium subscribers worldwide, up from 71 million in the corresponding quarter of 2017. Spotify is a music streaming service originally founded in 2006 in Sweden. Spotify allows users to browse through a catalogue of music, licensed through multiple record labels, and create and share playlists with other users. Additionally, users are able to listen to music for free with advertisements or are also given the option to purchase a subscription to allow for unlimited ad-free music streaming. Spotify’s largest competitors are Pandora, a company that offers a similar service and Apple Music, which was launched in 2015. Pandora, is the highest-grossing music app title in the Apple App Store. In November 2018, the app generated 14.55 million U.S. dollars in revenues. Users are also able to register Spotify accounts using Facebook, enabling them to connect with other Facebook friends and see what music they listen to, as well as listen to their playlists. Facebook users can connect to Spotify directly through the website using an app. Spotify is also a popular source for keeping up-to-date with music - a survey of U.S. consumers in 2017 revealed that 33 percent of respondents used the service to do so. Other popular sources of new music were friends and family, YouTube and radio.